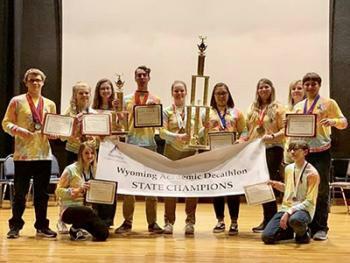 For the third year in a row, Wheatland High School’s Academic Decathlon team brought home top honors from the WYAD State Competition, besting second place Laramie High School by over 6,000 points and third place Riverton by almost 12,000 points. Of the 105 medals distributed (some categories had ties), WHS team members earned 56 of them. Wheatland also won the Super Quiz Competition by a significant margin. In the Varsity division, Paige McClaugherty took second highest overall scorer earning an $800 scholarship and Noah Crowley took first place honors earning $1,000. Wheatland swept the Scholastic division with Calysta Bascus taking third and $600, Matthew Wilhelm earning second and $800, and Quinn Lawrence taking the top spot and $1,000. In the Honors division, Elyse Rutherford received the second place title with $800, and Cali Moody was the overall competition top scorer earning a $1,000 scholarship. Elyse Rutherford was nominated by her teammates and given the Team Spirit award. Elizabeth Crowley 3 Bronze 4 Silver; Elyse Rutherford 2 Silver 3 Gold; Cali Moody 4 Silver 3 Gold; Claire Peasley 3 Bronze 1 Silver. Calysta Bascus 3 Bronze 2 Silver 1 Gold; Matthew Wilhelm 1 Bronze 4 Silver 2 Gold; Quinn Lawrence 2 Silver 5 Gold; Colter Kennedy 2 Bronze. Noah Crowley 4 Silver 4 Gold; Paige McClaugherty 1 Bronze 1 Silver 5 Gold.